Perspectivism is the philosophical position that one's access to the world through perception, experience, and reason is possible only through one's own perspective and interpretation. It rejects both the idea of a perspective-free or an interpretation-free objective reality. In visual perception, the appearance of an object changes according to a viewer's relative position to the object. This human experience was developed in philosophy as perspectivism. Although Leibniz integrated this view into his philosophy, it was Nietzsche who fully developed it. His perspectivism challenged the entire history of Western philosophy, including the thoughts of Plato, Descartes, and Kant. Nietzsche explicated this perspectival or interpretive nature of human existence and attempted to justify the richness of the world that his perspectivism can depict. He shifted traditional questions of epistemology into the realms of axiology, aesthetics, and his unique philosophy of life. After Nietzsche, perspectivism has been taken up in phenomenology, postmodernism, and others. Perspectivism also highlighted the irreplaceable unique value of each individual and the value of differences and diversity. 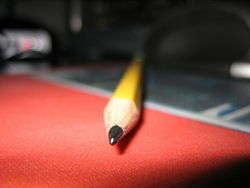 A sharpened pencil in extreme perspective. Note the shallow depth of field. Perspective, in the context of vision and visual perception, is the way in which objects appear to the eye based on their spatial attributes, or their dimensions and the position of the eye relative to the objects. As objects become more distant, they appear smaller, because their angular diameter (visual angle) decreases. The visual angle of an object is the angle subtended at the eye by a triangle with the object at its base. The further the height of this triangle, the distance of the object from the eye, the less the visual angle. This follows simply from Euclidean geometry. The Sun and the Moon appear to be roughly the same size because the Sun, although much, much larger, is also much farther away. The relationship between distance and apparent height of objects is not a linear pattern. If an object were actually touching the eye, thus being no distance away, it would appear infinitely tall. In our everyday life, a round table does not generally appear as round but as an oval. A rectangular table also appears to us not as a perfect rectangle but, rather, as a diamond-like shape. We seldom see a round table as a perfect circle or a rectangular table as rectangular. Although the appearances of the table are not round or rectangular, we understand the table to be round or rectangular. To see the table as round or rectangular, we need to see it from a particular point of view. When we identify the table as round or rectangular regardless of the variety of its appearances, we tacitly give a particular vantage point to the point of view to which a round or rectangular shape is presented. Non-perspectivist philosophers such as Plato, Descartes, Kant, and others presupposed the existence of objective reality (Ideas for Plato; objective world for Descartes; thing-in-itself for Kant) and contrasted it with the variety of appearances we experience. The philosophical quest for the one self-identical, unchanging reality is thus accompanied by cognitive powers and conditions of human beings, which allow them to see this reality. Perspectivism rejects these presuppositions held by such philosophers. It rejects the idea of the existence of an unchanging, self-identical objective reality and any privileged cognitive capacity of human beings such as reason. Plato distinguished the world into two realms: the world of Ideas and that of sensible, material phenomena. He ascribed reality ("ousia" = "true being") to the former because of its changelessness and permanence. When he made unchanging Ideas the true being, he also presupposed that human cognition and understanding strive to see these permanent Ideas. He tied his ontology of unchangeable Ideas with his epistemological ideal of viewing these Ideas. Based upon these ideas, Plato criticized artists since they paint and describe changing phenomena in diverse ways from each perspective. For Plato, a diverse phenomenal world is already a less valuable, ephemeral existence like a shadow of reality. The reality is, for Plato, objective reality free from any perspective. While Descartes rejected revelation, he accepted reason as the natural light from Medieval thinkers. He developed a theory of knowledge which relied on the power of reason. His rationalism, however, was tied with his conviction that reality was objective, free from a variety of perspectives cognitive subjects may hold. The conviction or belief of the existence of objective reality was still found in Kant. His concept of thing-in-itself indicates the existence of reality which is beyond the different perspectives of viewers. Leibniz, contrary to his predecessors, recognized the perspective character of human perception. Each individual (which he called "monad"), he argued, reflects or perceives or mirrors the world from his own perspective. Since each "monad" (individual) is a center of dynamic activities, the world for Leibniz is a dynamic whole filled with multiple perspectives. Libnizian perspectivism in perception was later developed by Husserl and French phenomenologist, Maurice Merleau-Ponty. Husserl recognized the perspectival nature of human experience. Heidegger and other phenomenologists were aware of it and developed the issue in various ways. Maurice Merleau-Ponty developed it the area of perceptual experiences. In his Phenomenology of Perception (first published in French in 1945), Merleau-Ponty gave a phenomenological analysis of perception and elaborated how one constitutes one's perceptual experiences, which are essentially perspectival. The essential partiality of our view of things, he argued, their being given only in a certain perspective and at a certain moment in time, does not diminish their reality, but on the contrary establishes it, as there is no other way for things to be co-present with us and with other things than through such "Abschattungen" (profiles, adumbrations). The thing transcends our view, but is manifest precisely by presenting itself to a range of possible views. The object of perception is immanently tied to its background—to the nexus of meaningful relations among objects within the world. Because the object is inextricably within the world of meaningful relations, each object reflects the other (much in the style of Leibniz's monads). Through involvement in the world, the perceiver tacitly experiences all the perspectives upon that object coming from all the surrounding things of its environment, as well as the potential perspectives that that object has upon the beings around it. Each object is a "mirror of all others." Nietzsche rejected the idea of objective reality or true being, superposed by diverse thinkers such as Plato, Descartes, and Kant. These philosophers were equally convinced of the intellectual or rational capacity of human being as the faculty of mind, that can liberate human beings from misunderstanding, misinterpretation, and prejudice. Nietzsche, however, went further and rejected the idea of neutrality of philosophical concepts such as substance, being, self, subject, and others. His predecessors generally presupposed and used those philosophical concepts as given legitimate notions. Nietzsche, however, argued that these philosophical concepts were fabricated and invented as a conceptual fallacy by those philosophers in order to interpret the world from a particular perspective. There is only a perspectival seeing, only a perspectival "knowing"; and the more affects we allow to speak about a matter, the more eyes, different eyes, we know how to bring to bear on one and the same matter, that much more complete will our "concept" of this matter, our "objectivity" be. (Friedrich Nietzsche, On the Genealogy of Morality: A Polemic. trans. Maudemarie Clarke and Alan J. Swenswen. (Indianapolis, IN: Hackett Publishing, 1998). Although Nietzsche rejected presuppositions of traditional epistemologies, he did not attempt to establish a new one. He rather shifted the entire question of knowledge into the question of values. Interpretation ascribes a value perspective to the interpreter. Nietzsche evaluated the entire philosophical apparatus based on the criterion whether it contributes to the affluence or overflow of the power of life. From his perspective, traditional philosophies and Christianity blocked the affluence or overabundance, which is the essence of life. Rather, a dynamic, creative multiplicity of meanings of the world can be secured only when the world is viewed and interpreted from multiple perspectives. In his Will to Power, an aphorism posthumously-compiled from Nietzsche's notes, he wrote on his perspectivism which describes the world as having multiplicity of meanings. While Nietzsche described the world as having "countless meanings" generated by interpretations from diverse perspectives, he denied any form of meanings intrinsic to the world itself. Thus, his perspectivism was tied with nihilism which he drew from the consequences of God's death. In his world, on one hand, human beings are striving for overabundance of meanings and values, on the other hand the entire world is underlain by Godless nihilism. Nietzsche's thought is sustained by this tension, which is a unique characteristic of his philosophy. Perspectivism raises many questions and issues. First, is Nietzschean perspectivism relativism? Since it rejects objectivism and the idea of the definitive singular reality or truth, it is relativism. However, it does not mean that all perspectives are equally valid. While Nietzsche argued that all of philosophical views were established from particular perspective (perspectivism), he rejected almost all those perspectives as invalid at the same time. In this sense, the Nietzschean perspectivism is not cultural relativism which accepts the validity of multiple perspectives. It should be also noted, however, that postmodernist thinkers adopted Nietzschean perspectivism and expanded it to various forms of pluralism and relativism. Second, if Nietzsche argued for the universality of perspectivism, is his view not one of several possible perspectives? Nietzsche would certainly accept that his philosophy was developed from his own perspective. Furthermore, if all views are interpretations, is his view an interpretation? Again, Nietzsche would accept that his view is an interpretation. He, however, would argue that all perspectives and interpretations are not equally valid. He would certainly reject all others except his own perspective. Third, if one can access the world only from one's own perspective, how can one understand another person's perspective? Even if one tries to understand others, one's perspective is already confined to what one can see and know. How can we avoid the problem of solipsism? Fourth, if the world is accessible only from one's perspective, can we in any way speak about objectivity? This question was later developed by phenomenologists, including Merleau-Ponty, as the issue of intersubjectivity. José Ortega y Gasset, a Spanish philosopher, has conceived of a potential sum of all perspectives of all lives which could produce an "absolute truth." Fifth, some contemporary philosophers argue that universality and objectivity exist not in reality but in the realm of languages alone. The use of common conceptual vocabularies gives us a quasi-objectivity. This has been already discussed by Nietzsche. Sixth, interpretive nature of human existence was taken up by Heidegger and Gadamer who reformulated it as the universality of hermeneutics within phenomenological contexts. ↑ H.E. Burton, “The optics of Euclid,” Journal of the Optical Society of America, 35 (1945): 357-372. Anderson, R. Lanier. "Truth and Objectivity in Perspectivism." Synthese. 115(1) (1998): 1-32. Burton, H. E. The optics of Euclid. Journal of the Optical Society of America, 35 (1945): 357-372. All links retrieved March 10, 2019. This page was last modified on 11 March 2019, at 00:16.